Years ago I wrote about how to make “The Swedish Log Candle” and have since noticed many variations of the same theme appear throughout the internet. While log candles can be used for cooking, rocket stoves in general have been a popular topic as well. There are now a number of various rocket stoves that are made out of a single log, similar in effect to a log candle. After viewing several videos on one log rocket stoves I decided to try it out for myself. Although I believe pine would be a prefered wood, I used a seasoned poplar log that I had available. I recommend using a corded high-torque drill for this process. I set the 14″ log upright and used a 1 1/2″ blade bit to drill a 6″ deep hole down the center from the top. Then I layed the log on it’s side and drilled a second hole, intersecting the first hole at it’s bottom end. Just a note: at the point of intersection, a blade bit can give a hellacious “kick” so be careful as you approach that point. After blowing out the saw dust I set the log upright to begin preparing it for fire. As long as I took the liberty of using an electric drill to make a natural material rocket stove, I also took the liberty of using a manufactured tinder by using bamboo skewers. Purists can figure a way to approach this project more naturally but I figured “who cares? This is fun!” I collected a bundle that was about a third of the volume of the hole and poured gasoline on it and the hole walls before inserting them down the shaft. It’s important to “wet” vs. “flood” so as not to have the fluid stream out the bottom hole. Use caution when lighting it with a match or lighter. In this case gasoline was handy but other accelerants would work as well. Conventional rocket stoves have larger diameter holes and thus fuel can be fed from the bottom hole. 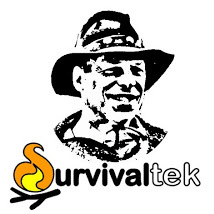 When I tried this approach it seemed to choke out the airway and snuff out the existing flame, so I recommend feeding any kindling from the top during the initial process of establishing the stove’s fire. Once the flame was established I selected three 1″ high stones that I placed around the top surface of the log which became the tripod or trivet for my pot and pan. I initially brought a pot of water to boil for coffee, then continued with a pan with which to fry bacon and eggs. Although this rocket stove takes some “manufacturing” to make, it is a great project for a number of reasons. These can be made ahead of time and stored for power outages, camping trips and garden gatherings. Outside of a little tinder and some accelerant, they are self contained and don’t require the gathering and consumption of local natural materials. They can be controlled and extinguished by using a spray bottle of water and thus can be used multiple times. Because it is elevated, it can also be used in a wet environment. Furthermore, they last for hours and are a joy to use. This entry was tagged Camping, Cook, Cooking, DIY, Fry, Log, Rocket Stove, Stove. Bookmark the permalink. You should never, never, never use gas to start a fire! Careful with rocks as they can explode when heated. Do not get rocks from a river or creek bed. When drilling the holes, save the saw dust. Mix the saw dust with wax to make starter sticks. Instead or rocks, you could drive 6 or 8 nails in the log. Kerosene would be a better choice of accelerant. We have been making candles like this since discovering them on a motorcycle trip through British Columbia. However we notch out a v groove in a cross pattern at the top. 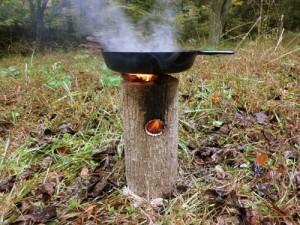 It allows pot to sit stable on the top of the log without snuffing out the fire. Have yet to see this design online. Just want to note that, depending on where you are going (Yosemite, for one), they ask you to NOT bring outside wood. Wood from elsewhere could contain contaminates, insects, parasites, etc. and they don’t want these introduced into the area. “I recommend using a corded high-torque drill ” ya we’ll all have that available if the SHTF and the world goes Road Warrior. 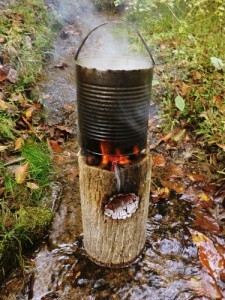 One Log Rocket Stoves can be made ahead of time and stored for power outages or camping trips. The right term is Lumberjacks Candle (Jätkänkynttilä) and it got nothing to do with Sweden. It is from Finland. Now to make it more survialistic. The true, real, no doubt about it, original name for them is “keelah’ ikmiktutat”. It is Athabaskan for “cooking log” (acutally cooking stick, there is no word for log in Athabaskan). My people are Atha and we have used these for thousands of years. No drills obviously, but we used (and still do), hot stone to bore out the holes and bone knives to do the chipping. Not quite as round, but just as good! With regard to drilling the holes, some old-times remember a tool we’ve had in our workshops forever: It’s called a brace and bit, and it works just fine with muscle power! The brace, for the uninitiated, holds the bit and is shaped much like the handle of a screw type automobile jack. The bit, which cuts the hole come in various sizes, but for this purpose I suggest an adjustable one that can be found in any good-sized hardware store. Mine can be opened up to cut a hole as large as 2 inches which is all that is needed for this cooking log. In fact, if you cut 3 1+ inch holes around the sides of the log, mating up with the vertical shaft, it will improve the air flow considerably. A small snack sized bag of doritos would be all you need to start a fire… accelerant and kindling in one with out chemicals .. just put the wood kindling if needed on top of the doritos. KEN…thought making the log was a bit labor intensive, but I kept on reading until my eye read “gasoline’ up to my brain! Before it even GOT THERE, I closed out, LOL! Didn’t read all the comments, but no matter HOW “modern” I get, I will NEVER put gasoline on a fire! In the utmost emergency, MAYBE Diesel Fuel, but hope to never get that desperate. However, I most certainly admire your pursuit of ALL things fire oriented! I still think that inside of you is an “arsonist” busting a gut to get out……….but your nature has found a way to tame the urge! LOL…………KEEP having fun, Ken.that is what this earth is all about! OH by the way, Robert is right………first “drill” I was allowed to use alone and I still have it…………won’t dislocate your shoulder on THAT ONE!